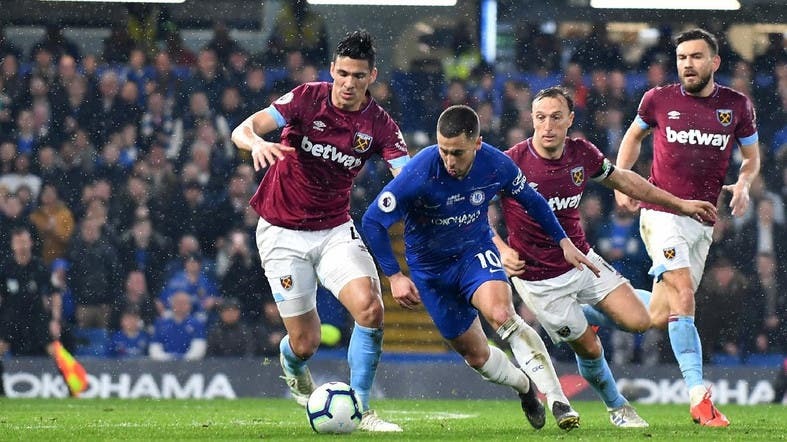 Hazard danced through West Ham’s packed defense in the 24th minute to put Maurizio Sarri’s side in front and Gonzalo Higuain should have buried the visitors before halftime. West Ham improved after the break and Manuel Lanzini and Felipe Anderson both had good chances to equalize but Hazard sealed the points in the 90th minute with a clinical finish. Hazard was in a class of his own, giving the Stamford Bridge faithful another example of why they are so desperate to avoid him moving on at the end of the season - a fact not lost on West Ham’s fans who chanted that about Real Madrid’s interest. The 28-year-old’s masterful brace means he now has 19 goals in all competitions this season - equaling his previous best for Chelsea in 2014-15. Taking possession of the ball 35 meters from goal with a blanket of West Ham players blocking his path to goal, Hazard first accelerated into the area past Declan Rice and Mark Noble. West Ham offered more threat in a much more evenly-balanced second half and both Felipe Anderson and Manuel Lanzini had good chances to equalize while Marco Arnautovic headed just wide. This time he collected Ross Barkley’s ball over the top and before West Ham’s defense could close him down, he fired a shot across Fabianski into the far corner.